Rituals are a Dutch brand that I’d previously spotted in John Lewis, but hadn’t explored. So I was curious to find out more about them when I popped into the launch of their latest line, Tao. The Tao range is inspred by the ancient Chinese life philosophies encompassing energy, balance, peace and serenity. All that Yin & Yang stuff. Qi. Not only a top scorer in a game of Scrabble, but a surprisingly lovely stress relief serum. I say “surprisingly” ‘cos I’m generally unaffected by things that are supposed to make you feel better if you sniff ’em or apply them to pulse points. The most “alternative” I ever get is a drop of Bach’s Rescue Remedy on my tongue, and doing it always makes me feel like a bit of a wally. I had a few drops of Qi (£8.50) massaged into my temples and the smell of Chinese Peppermint really invigorated me. I spent the next half hour feeling a strange and totally pleasant warming sensation around my temples which had the effect of keeping me feeling sharper and more alert during my usual mid-afternoon slump. I’ve never really experienced anything quite like that before. 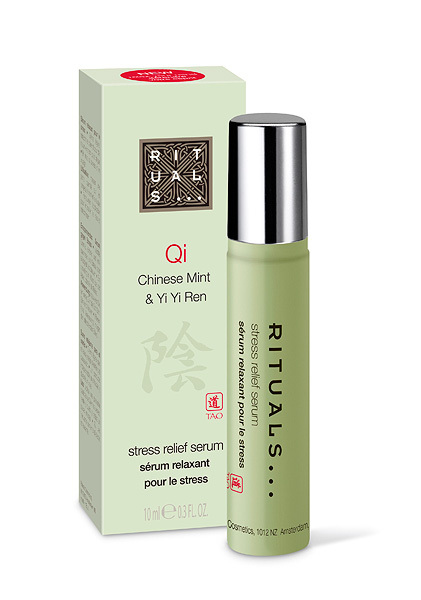 I’m waiting for Qi to come into stock on the Rituals website so I can pick myself up a bottle. The Tao Range is available online from the Rituals website.